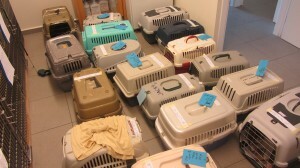 The Veterinary Clinic of the Cyclades is a small animal clinic founded in June 2012. Actually it is the evolution of Mr. G. Maragos’ veterinary practice which operated in Ermoupolis between 2002 and 2012. The clinic was created to meet the need to provide higher quality services to our customers. It is located in Syros on the road to the airport and has a surface area of 350 square meters. Additional spaces include the back yard where pets can exercise and a parking area. Our staff includes two veterinarians, three nurses, two secretaries and one caregiver. What makes a pet clinic different is that it meets the requirements under applicable law to offer hospitalisation for sick animals. 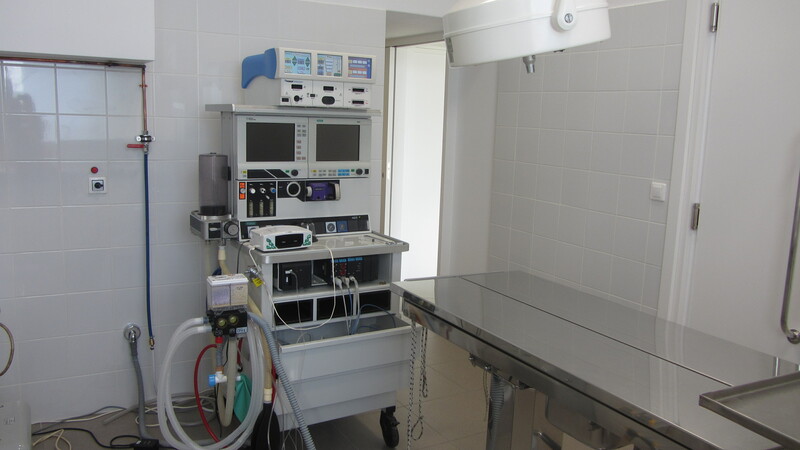 Our clinic has separate infirmaries for dogs and cats, two operating rooms to cater for both septic and aseptic surgery, modern imaging equipment and a laboratory. We constantly invest in the training of our veterinarians and make sure that our clients are informed about the prevention and treatment of pet diseases through both information messages and seminars. Today, the needs of pets are very well documented and we believe it is our duty to talk about them and inform people who want to cater for them properly. We trust that we have created an elegant space accessible to all, and we are at your disposal to discuss any concerns you have about your pet. Our veterinarians can advise on veterinary matters, while other members of our staff specialise in nutrition, training, grooming, all of them having the health of your pet at interest. This is where your pet’s clinical examination is performed. We work on an appointment basis to ensure fast service and smooth operation of the clinic. On average, our patients have access to the outpatient clinic for 10 hours daily and 5 hours on Saturdays. 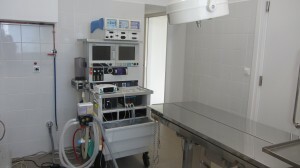 Surgeries are performed in a specially designed area that meets all hygiene and asepsis requirements. There are two operation rooms, one aseptic and one septic. Further, the use of modern anaesthesia devices and instruments for monitoring the vital functions of our patients, contributes to the safety of operations. Anaesthesia is always supervised by an operation room nurse and, if required, by a veterinarian. In our efforts to provide high-quality health services to our four-legged friends, we invest in the continuing education of our veterinarians and the modernisation of our equipment. We can deal with all kind of oral cavity problems, giving your pet a clean mouth free of bacteria, odour and pain. Dogs and cats alike live many years and it is of paramount importance to ensure a healthy mouth. For patients who need constant care, our clinic possesses the infrastructure and the legal right to offer hospitalisation. There are two infirmaries, one for cats and one for dogs. It is very important, especially for cats, not to be in the same room with dogs because that causes them to stress. The stress caused by barking, tail wagging, the smell of dogs, etc. has a very strong impact on the welfare of cats, the amount of food they consume, how often they visit the litter box, their wound healing ability. Our staff ensures a safe stay, cleanliness and general hospital care based on the general principles that can be summarised in the phrase “clean, warm, safe and dry”. A state-of-the-art X-ray machine and ultrasound system enable us to immediately perform the exams necessary to investigate the cases that are brought to us. 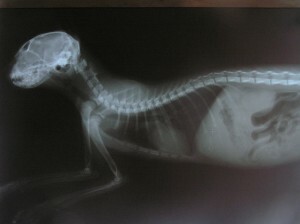 Simple and complex X-ray exams are performed, as well as abdomen, heart and pregnancy ultrasound exams. Blood, biochemical, immunological and cytological exams are run at the Clinic for immediate results without any delays. For more specialised examinations, we work with laboratories in Athens and abroad. In cases of emergency, a vet is available 24-7-365 by calling the emergency line. House calls are made on an appointment basis. If necessary, we can transfer your pet to the Clinic. We are actively involved in municipal programmes for sterilising and caring for stray animals. We earnestly participate in mass sterilisation programmes for cats, which we organise in cooperation with animal welfare groups and individuals. We offer low-cost sterilisation services for the pets of senior citizens, the unemployed and students. Visits involving stray animals are free, while we only charge 50% of any healthcare costs involved. We also offer sterilisation services for stray animals in the care of individuals at half price.